Have you heard of the BedJet yet? During this heatwave, you may want to grab one to stay cool during the night, and warm during the winter! I may have mentioned the fact that I live in Utah more than a few times. However, I originally hail from the wonderfully temperate climate of California. I am now subjected to 4 whole seasons, although arguments could be made for the fact that Utah really only has 2 seasons these days, Winter and Summer. I haven’t seen a Fall or Spring in ages! So, I’m either WAY too hot, or WAY too cold. My husband, the wonderful man that he is, will occasionally “warm up the bed” by sticking my hair dryer under the covers for a little while during my “getting ready for bed” process. It always terrifies me when he does this, though, because it’s just such a fire hazard! I love climbing into a nice cozy warm bed in the winter, so I just don’t say anything about the inevitable fact that someday he will burn the house down with this nice gesture. Summertime is a totally different story. My husband usually requires a few fans blowing on him to remain comfortable through the night. He also currently works a graveyard shift, so he needs to sleep during the day when it is really hot outside. This week has been hovering around 100 degrees every day! First thought… hilarious. Second thought, I knew I wanted to try the BedJet out. I reached out to see if they had the capability to send me one to review, and lucky for me they did. However, I am not being compensated for this review. The did ask, prior to shipping, if I had the appropriate clearance under my bed, and I thought I did, but when we went to stick it under there it started to push the box spring up a bit. It wasn’t too concerning though, because I was able to set it up just fine at the foot of the bed. The BedJet is almost just like it sounds. 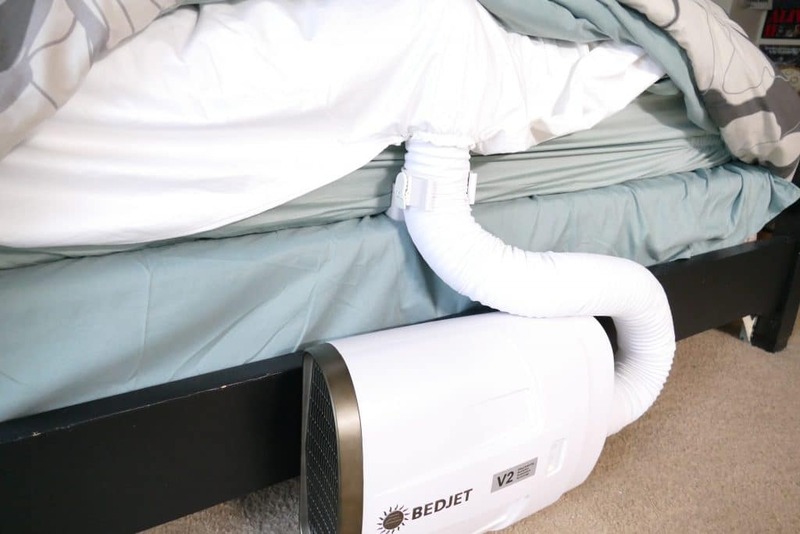 There is a fan-shaped blower, that pushes a jet stream of air throughout the bed. You can use it with the recommended AirComforter Cloud Sheet Accessory, or just stick it under your current sheets. The Cloud Sheet is really the best way to go though, since I tried it both ways for research purposes. As the sheet fills with either warm or cool air, it keeps that air circulating around your body throughout the entire night. How do you install the BedJet? 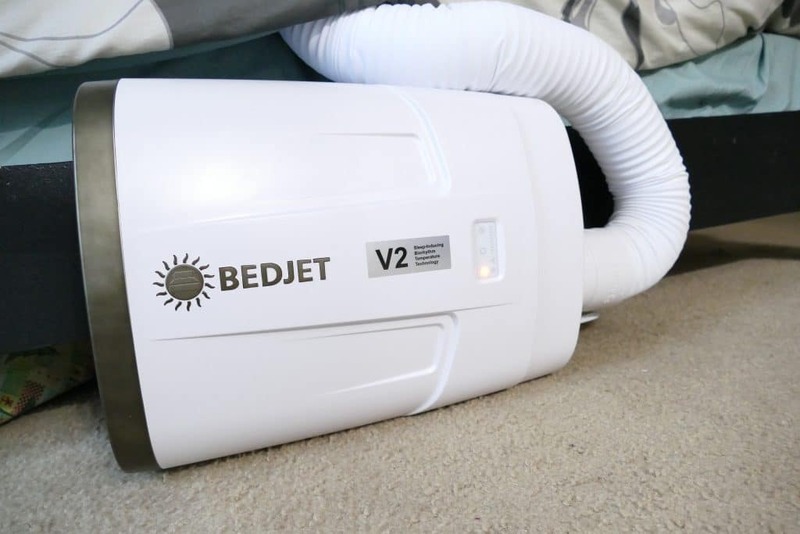 The BedJet can be placed under your bed laying flat if there is space. It can also be installed like we have it standing straight up. You can purchase a stand for it to make sure it doesn’t topple over, but it seems pretty sturdy even without the stand. It needs to be plugged into an outlet and comes with a fairly long cord. You could also use an extension cord if necessary. There is a holder for the tube that is just wedged between the mattress and the box spring on our bed. You want the “fanned” portion of the hard plastic tube to sit right on top of the bed. There are extenders for the holder if you need it to be higher. It wasn’t quite clear if the snaps on the sheet were supposed to stay unsnapped while the hose was inserted. We found that movement during the night caused the sheet to come off the hose if they weren’t. Once we pulled the sheet down over the fanned portion of the hose and snapped the opening together as tightly as we could, it was able to stay put all night no matter how much my husband tosses and turns. 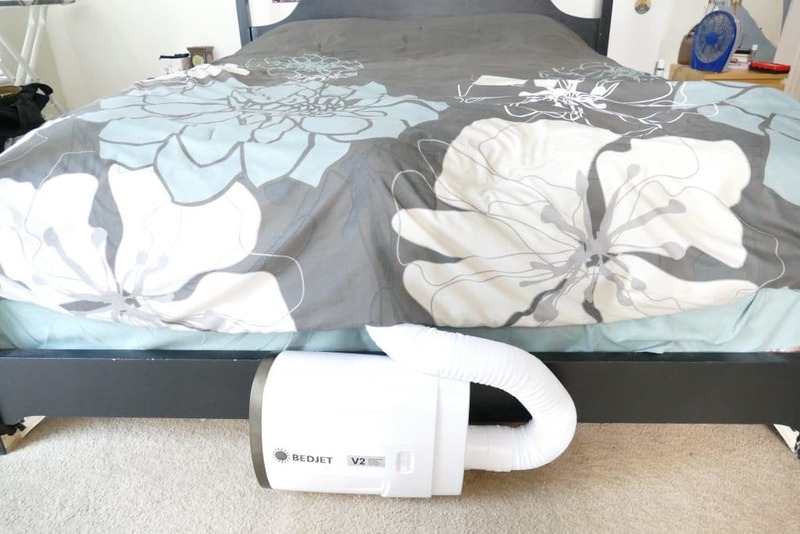 There is no doubt using BedJet is safer than my husband’s previous method of heating up the bed with the hairdryer. However, it is also safer than an electric blanket. The methods electric blankets use to distribute heat can be unsafe. Many will now shut themselves off automatically during the night, leaving you freezing in the morning. Plus electric blankets would do nothing to help keep you cool in the Summer. As the above video shows, BedJet has the capability to have 2 completely different temperatures set for one bed. This is great for couples who prefer to sleep at different temperatures. The commercial does not make it clear that the BedJet requires 2 devices to make this happen. You also would want to grab the dual-zoned AirComforter Cloud Sheet Accessory. 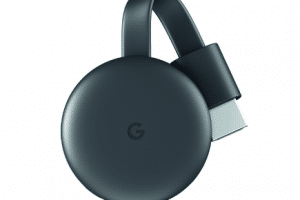 The company only sent me one device, so I wasn’t able to test this feature out. 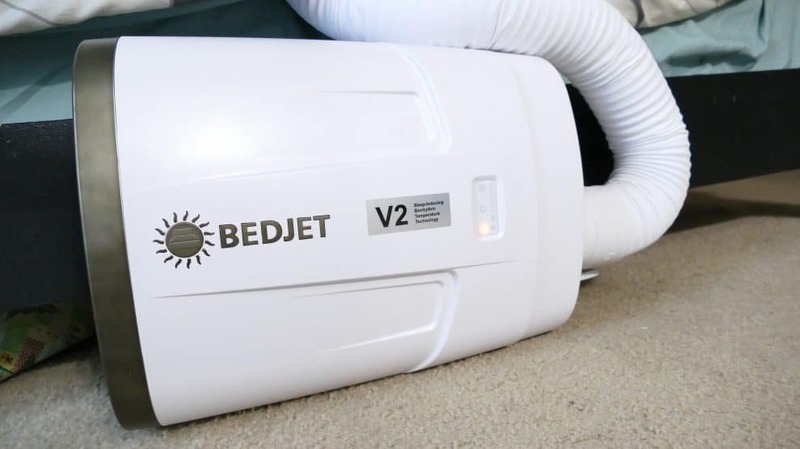 My husband and I have been able to use the BedJet for a few weeks now. I can say that I can completely tell a difference in how well my husband has been able to sleep after working a 12 hour night shift. He is able to sleep for a longer period of time, which gives him ample rest for his next shift. Currently, the BedJet is a little on the cold side for me at the temperature my husband prefers. The Winter will allow this sucker to prove its worth to me though! I am SO excited to see how it fares during this Winter! You can move the location of the BedJet so it blows more on one side of the bed than the other. The Cloud Sheet has multiple entry points so you can pick your preferred BedJet location. So we are moving the BedJet to his side of the bed for summertime and my side of the bed for the winter. The device comes with a remote that activates the BedJet with just the touch of a button. Pressing the “cool” button once will set the BedJet to run for the next 10 hours. You can adjust the time through an app you can download on your phone. The app itself (for Android at least) could use a serious facelift. However, it does have several useful features like setting an alarm, controlling the airflow and setting a specific temperature for the air. Overall, we are incredibly happy with this device! It really works as advertised, and has been heaven sent during this unbearable heat.